Obon is an occasion when we, Japanese people, are reunited with the relatives, visit and clean the family’s graves and honor the spirits of the ancestors. Generally obon is from August 13th to 16th though it depends on the regions. 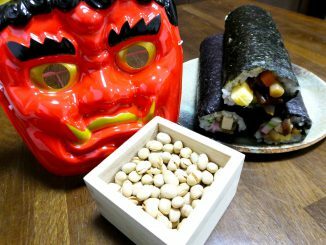 We believe the spirits of the ancestors make a homecoming visit and stay in this world during obon, so we offer food and flowers to them at Buddhist home altars. 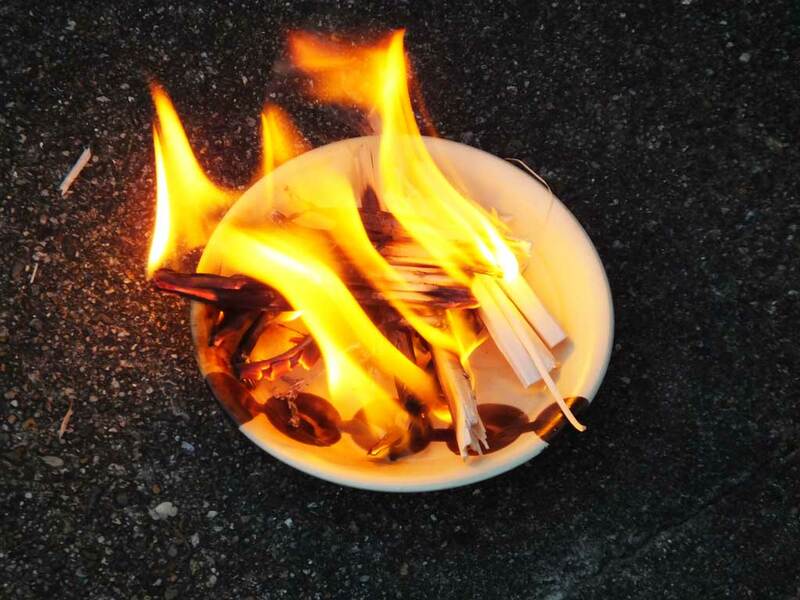 On the first day of obon, we welcome the ancestors by making small fires at the entrances of the houses. Some people hang paper lanterns instead of making the fire. 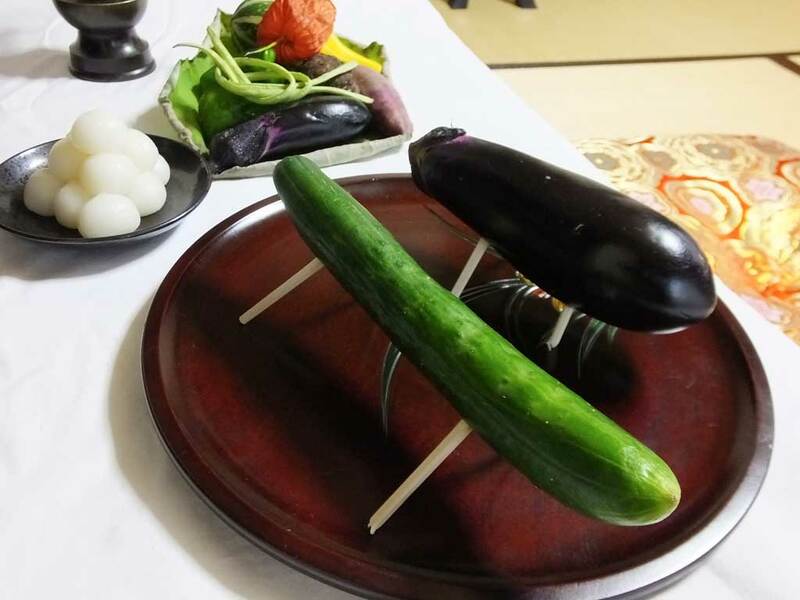 Also, there is a custom to make a horse out of a cucumber and a cow out of an eggplant, and put them in front of the home altar. It is believed that ancestors ride on the horses when they come home, and they ride on the cows to return to the spirit world, because people hope they come soon and go back slowly. During obon, Buddhist priests are invited into people’s homes to chant Buddhist sutras at the home altars. Obon is one of the busiest time of the year for them. Maybe you can see priests in their cars or even on their motorcycles in this season. When I was a child I thought it was an odd sight because it looked incongruous. Obon is sacred but fun time. Some people wearing yukata go to summer festivals at temples, shrines and public places such as parks and schools. Anyone from children to the aged dance bon-odori there. 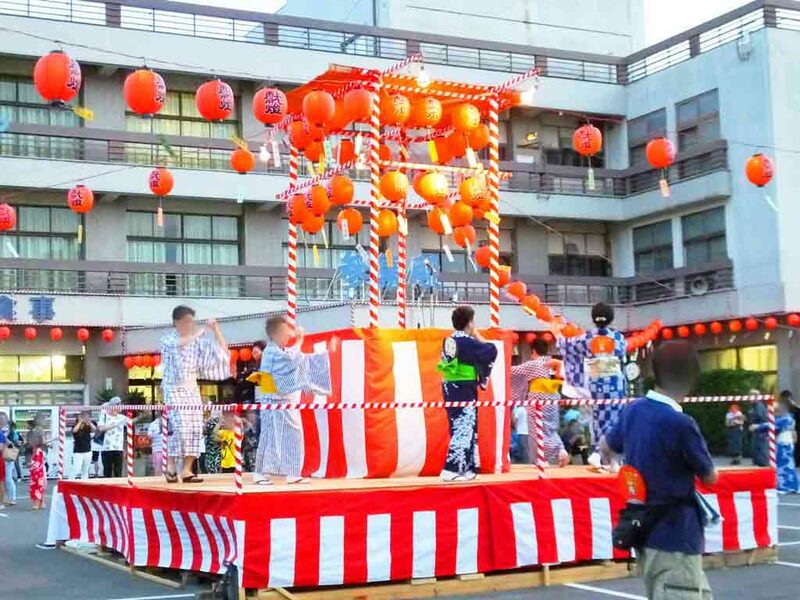 Bon-odori are folk dances for obon that varies from region to region. The most famous bon-odori in Japan is Awa Odori (Awa Dance). Awa Odori Festival is annually held from August 12th to 15th in Tokushima Prefecture, Shikoku. 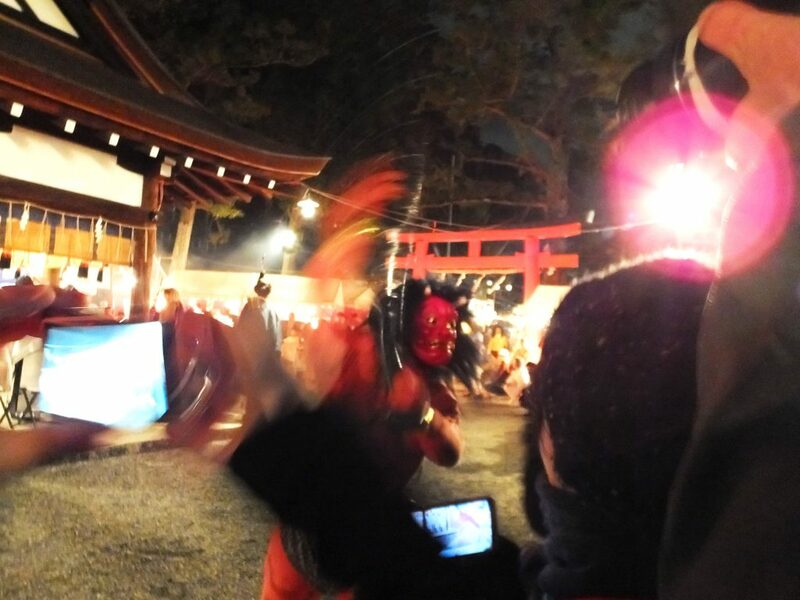 It is one of the largest dance festivals in Japan. On the last day of obon, we make small fires again, at the same place as the first day. This time it is to see off the spirits of the ancestors. This is called okuribi. 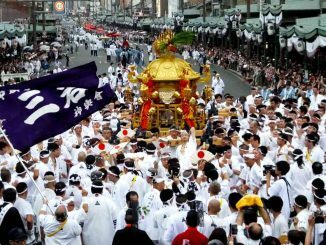 The famous event, Gozan no Okuribi (Daimonji) is a kind of the okuribi. 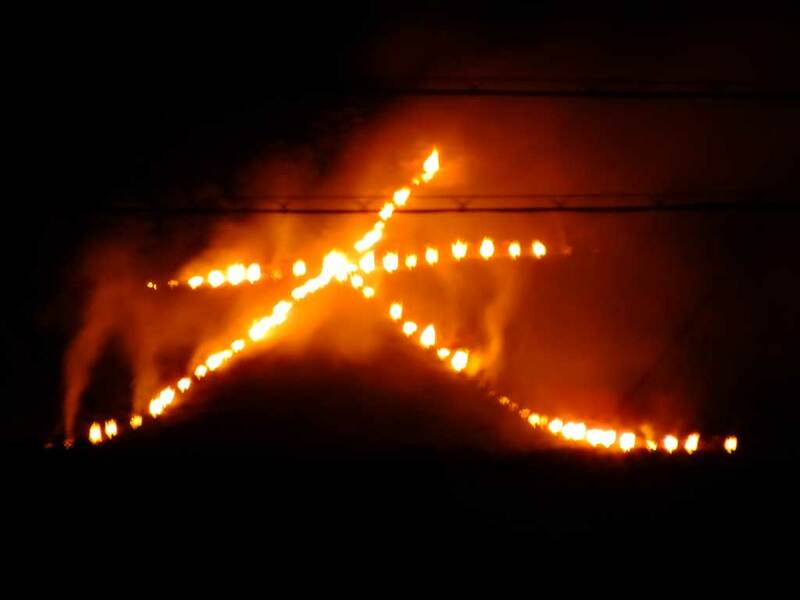 At Gozan no Okuribi (Daimonji), you can see giant bonfires on five mountains. It is held in Kyoto on August 16th. Also, in some regions people float paper lanterns on rivers or the sea as memorial services for ancestors. It is called Toro Nagashi, and regarded as a kind of okuribi. Obon is a great opportunity for family gathering because schools and many companies have obon holidays. These days some people travel in Japan or go abroad, too. It is natural that traffic jams should be a problem every year. The first peak called ‘homecoming rush’ and the second peak, ‘U-turn rush’ are broadcast on TV and radio. I hope ancestors are not stuck in traffic and go back to the spirit world happily.